This Stackers Square Valet is shown here in a classic vintage brown with orange lining. 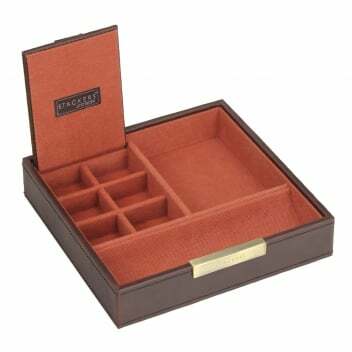 Featuring a lidded compartment which is ideal for storing cufflinks and rings and a larger area perfect for phones and wallets. Stackers allow you to build layers by perfectly stacking different styles on top of each other. We think its an ideal way to look after the accessories you love and cherish.